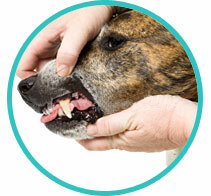 The most common disease affecting pets is dental disease? It is a fact that most dogs and cats are already suffering from dental disease by the age of three. Bacteria from gingivitis and periodontal disease can spread throughout the rest of their body causing infecting the heart and kidneys. Left untreated, dental disease causes pets to die an average of two years earlier than they would have if they had proper dental care. However, with regular professional dental care from your veterinarian followed by maintenance at home, you can prevent dental disease before it becomes a serious problem. Begin a dental care regimen at home. Your veterinarian can suggest steps that may include brushing your pet's teeth. One of the most convenient and effective ways to combat oral disease is feeding specially formulated foods proven effective in combating plaque and tartar buildup. Schedule regular veterinary checkups. These are essential in helping your veterinarian monitor the progress of your pet's dental health routine. Your veterinary health care team can help you schedule the appropriate visits. Toothbrush: Use a soft-bristled toothbrush. Anything other than a bristled tooth brush will not get below the gum line (the most important area to brush). Toothpaste: Use toothpaste specially formulated for pets. They have flavors that are appealing to pets and make brushing a more pleasant experience. Human toothpastes and baking soda may cause problems if your pet digests it. How to Brush: Start by offering a taste of the toothpaste. The next time, let your pet taste the toothpaste, and then run your finger along the gums of the upper teeth. Get the bristles of the brush along the gum line of the upper back teeth and angle slightly up, so the bristles get under the gum line. Work from back to front, making small circles along the gum lines. It should take you less than 30 seconds to brush your pet's teeth. Do not try to brush the entire mouth at first. When: Pick a time of day that will become a convenient part of your pet's and your daily routine. Brushing before a daily treat can help your pet actually look forward to brushing time. If not possible daily, at least every other day. It will be a little while before both you and your pet gets used to the process, but it will soon be routine. Follow with praise and a treat each time. Dental Treats: Some treats are designed to clean your pet’s teeth and reduce plaque while containing vitamins and minerals that are beneficial for health and resulting in fresh breath. 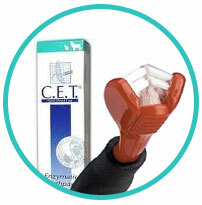 It is a great way to supplement your pet’s dental care or alternative to brushing when you are short on time. What kind of treats do u recommend?